Q8-DEWANIYA: Maldives government dives for some changes! Maldives government dives for some changes! 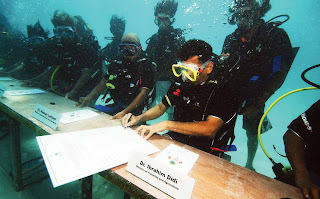 6 meters below the surface of an island, President Mohammed Nasheed and 13 other government took their seats at a table on the sea floor , and the reason behind this was to draw attention to fears that rising sea levels caused by the melting of polar ice caps which could swamp this Indian Ocean archipelago within a century. u could have read it on the source.